We’d love your help. Let us know what’s wrong with this preview of Inside Paragraphs by Cyrus Highsmith. An manual for typographers seasoned and green alike. This book goes in depth on setting tracts of text for long reading, with a strong emphasis on print. To ask other readers questions about Inside Paragraphs, please sign up. «A line with tight letter spacing but loose word spacing has incompatible kinds of spacing. The words are fast but the space between them is slow. The rhythm of the line is choppy and bad for the ﬂow of text. It’s like listening to someone who talks by blurting out one word at a time. Highsmith's Inside Paragraphs deservers four stars out of five, if reviewed as a very short, easy-to-read introduction to typesetting. Highsmith doesn't really delve deep into the subject, and even if the book's written for a complete beginner, it feels that Highsmith uses a bit too much of the limited space to superficially explain things that would be obvious to pretty much anyone. 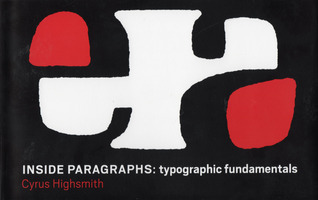 Then again, the short length and narrow scope of the book will ensure that many people who would not normally pic Highsmith's Inside Paragraphs deservers four stars out of five, if reviewed as a very short, easy-to-read introduction to typesetting. Highsmith doesn't really delve deep into the subject, and even if the book's written for a complete beginner, it feels that Highsmith uses a bit too much of the limited space to superficially explain things that would be obvious to pretty much anyone. This is a good book for someone just starting to think about laying out type. It doesn't go too far in depth. As the name would suggest, it makes a lot of the fundamentals for laying out longer form text (within paragraphs) pretty clear. Individual characters or text layout outside of the context of paragraphs isn't addressed much. I wouldn't say this offers much for "seasoned typographers", but still some useful advice worth coming back to. This was a great introductory book to typesetting, with nice illustrations and a clear humorous writing style that was easy to read. Great for a type rookie like me. Interesting introduction to typesetting, with an eye toward how the eye follows text and negative space on the page. It's a good introduction for the layperson. Brilliant - a timely reminder of typographic principles I had forgotten, and those I use daily but find too natural to be remarkable on. A good companion piece to Stop Stealing Sheep. This book helped me understand typographic elements with fantastic illustrations and text. I plan to use this with students in the future.